Michelle Obama definitely isn’t afraid to be seen in the same dress twice — or even three times. Case in point: her Merona dress from Target. 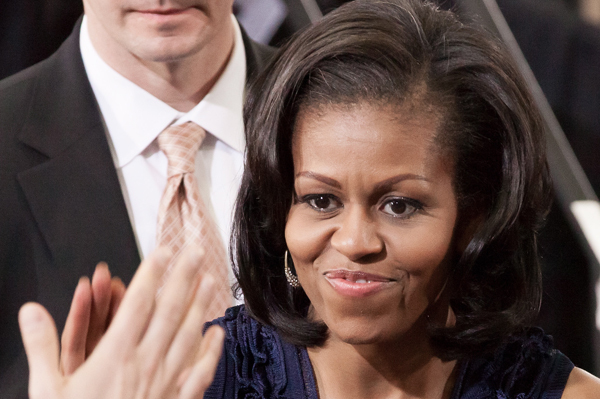 Don’t have the spare $398 to spend on a replica of Michelle Obama’s Tracy Reese dress? You’re in luck! Mrs. Barack Obama also loves budget gear — like really, really low-budget gear. Obama was spotted leaving — and returning — from her recent Hawaiian vacation wearing a black and gold Merona dress from Target. As others have pointed out, she also wore it for a 2009 event in Arizona. Love the dress? You’ll have to keep your eyes peeled for it on eBay, since it’s long since sold out at Target. However, we’re sure M.O. would approve of any dress Target has to offer since she loves budget fashion so much. Her frugal nature goes back to childhood, she said. As for her sense of style? People take it so seriously, but Obama said it’s all about having fun. We all need to be reminded of that from time to time. Kim Kardashian goes back to dark hair!